Get in the game: read! Summer Reading at Mesa County Libraries is just around the corner – the program begins May 23rd and you can register online now! 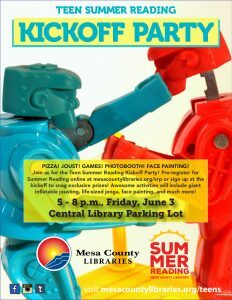 There are a ton of great teen events going on during the Summer, beginning with the Teen Kickoff Party on June 3rd from 5-8pm in the Central Library Parking Lot. Come by for pizza, giant inflatable jousting, facepainting, exclusive giveaways, and much more! Keep an eye on the events calendar for more upcoming summer events for teens, such a movie marathons, video game tournaments, workshops, and more. Still looking for the motivation to up your reading game during the summer? Check out this awesome video created by the Teen Advisory Group for the 2016 Colorado Teen Video Challenge – their video was a finalist in the state-wide competition! Posted in Summer Reading Program, Teens.